It’s Lantern vs. Lantern as John Stewart battles Hal Jordan for the leadership of the Corps! For months, John Stewart has let his anger build as Hal Jordan sent Guy Gardner into the Red Lanterns and declared war against other corps across the spectrum. After the devastating events of “LIGHTS OUT,” John is determined to rebuild the Corps as he sees fit—even if it means taking down his oldest friend! 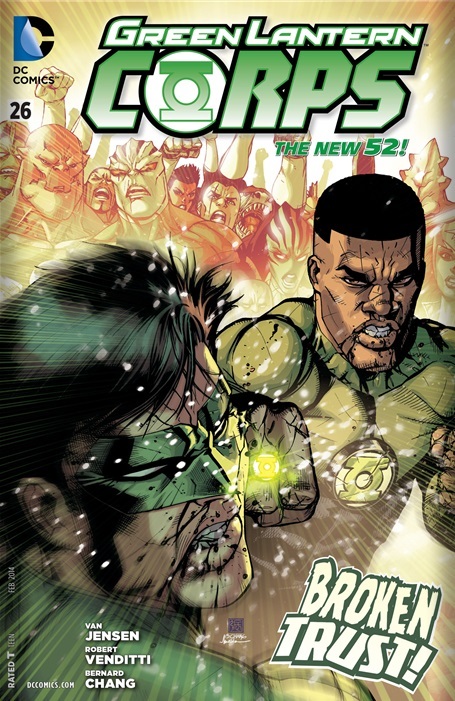 Cover- How awesome is it to watch John Stewart sock it to Hal Jordon in the mouth? More awesome than you would image! Art- Distinctive is the best word to describe the work of Bernard Chang. Some scenes were more detailed than others but it all looked pretty damn good! Story- John Stewart has relocated the corps to Mogo after their last battle resulted in the destruction of OA. He has harsh words with Hal Jordan as a contingent fly to a barbaric planet on a diplomatic mission. It fails and the race allies with shape shifters intent on destroying the Corps. On Mogo the shape shifters gather and continue to plot the destruction of the corps. Culture- While not a stretch I found the alien culture amusing and a welcome change from typical diplomacy. Action– Not all out surely but the few fights that took place were visually pleasing. Black Heroes- Power couple in the building! Fatality/Yrra and Green Lantern/John Stewart are both here and both in a non complex relationship that works on paper. Back story- I’ve been away for a while so I have no idea what happened with Relic. There was no small recap of what happened and new readers will be out of their depth. Fatality- She seems to have lost her imposing Amazon stature and is now much smaller than John Stewart. When did this happen? She’s not as imposing or distinctive as she once was. Even worse She appears to be suffering from the same affliction as Monet…….she is getting lighter/whiter!